Buzz Williams was all smiles after yesterday's triumph over the Villanova Wildcats. 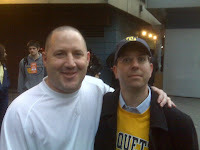 With the win his Warriors earned the right to play Friday night basketball at MSG in the Big East Tournament. Raise your hand if you saw this coming back in October. The Warriors' remarkable season (22-10, 11-7) continues tonight at the World's Most Famous Arena when they hit the court to take on the Georgetown Hoyas (22-9, 10-8). Tonight's Jesuit Jam is a revenge game for the Washington, D.C-based disciples of St. Ignatius Loyola, who fell to Father Jacques Marquette's crew 62-59 in January. Tipoff is scheduled for 6pm Marquette Standard Time on ESPN. Hoya Hoops previews the action. Luke Winn talks up Buzz. ESPN's Dana O'Neill on MU living in the moment. Anonymous Eagle does a fine preview of tonight's game. The Hoyas advanced to tonight's semifinal after juicing the Orange yesterday, 91-84. MSNBC discusses how Marquette's experience is carrying the team into March. New Jersey Newsroom recaps yesterday at MSG calling Lazar Hayward "the forgotten Big East star"
I never thought I'd say it but Bloomberg News talks up tonight's Jesuit battle. The AP notes that three of the top four teams in the Big East fell yesterday. Syracuse loses and all of a sudden the Big East Tournament format needs to be changed? East coast bias in action folks. Our own John Pudner recapped yesterday's win. A reminder to NYC-area Marquette fans --the university is hosting pre and post-game parties at Stout NYC, 133 W 33rd St, downstairs in Stout Cellar. My inner Jim Rome is coming out, that win was PHENOMENAL! Need to keep our 3pt % high and make our free throws. Lazar's last 2 free throws last night were heart stoppers. Proud of these guys. But, I hold our program to a high standard and expect them to perform year in and year out. Thanks for the link to our new MU blog anonymous eagle, much appreciated. If we can be half the blog Cracked Sidewalks is, we'll do ok.
My pleasure Admiral. It's good to see the online MU hoops community expand!